I felt very bad when I missed the Open Sesame 1. It is such a lovely event giving work to our brain and our creativity. Thanks DK and siri for hosting such a lovely event. Find the event details for Open Sesame 2. I chose box no:1 and within few hours came the riddle. When I first read the riddle I immediately thought it must be Apple. However, I confirmed with the help of Wikipedia for I didn't know that 'A moniker in my name for a city' is 'appellation' and the fact that Apple had 5 carpels. When I was sure, I sent my answer and was right at the first go.Yey me! After that the main thought was, what can I prepare differently with apple? I did not want to post apple milkshake or apple pie as they are the most common and predictable recipes made with apple. I thought of making a sweet with coconut so that I can send it to AFAM-coconut hosted by suganya too. Here comes 'Jiggiri Dost' Meaning best friend. Why I kept this name? When I was discussing this with my dad, he suggested this name because I used Jaggery and Roasted it. So instead of Jaggery I used Jiggiri and instead of Roast I used Dost to name the dish . very creative huh? all credits goes to my dad for naming this recipe. In a bowl, add all the ingredients to prepare the dough. Make it like a chappati dough. Let it rest for 15 mts. In a pan, add jaggery and water and make it a paste. Filter the liquid so that dirt from the jaggery is removed. Add the grated apple to the jaggery liquid and fry till the moisture is removed. Add the coconut and roasted cashew and mix well. Let it cool. Make small balls from the dough and roll it like you do for chapatti. 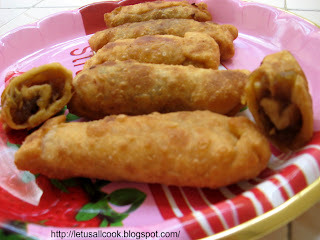 Place the filling inside and roll it as you will do for vegetable spring rolls. Note: This recipe will be delicious when hot. Variation: You can also use this filling and make kozhukatai and name it apple kozhukattai. Also you can use it as stuffing in poli and make apple poli. Very creative recipe and name Sangeeth. I also got apple and did something similar to this. I'll be posting it tomorrow. These look so much like spicy bajji's. Thanks for sharing the recipe of a creative snack! Wowo.. interesting sweet!!! never had these!!! thats one cute name Sangeeth..Lovely entry! Very nice recipe, looks great, yummy yummyyyyy!!!! Jiggiry dost is indeed a creative name Sangeeth! It looks delicious too. hey snageeth, theres something for u on my blog. check it out!! And what a sweet reward after unravelling the riddle. hi sangeeth, very nice entry... love the name!! also sounds like an interesting mix of spicy on the outside and sweet in the inside!